Take a magical journey across the rich ocean waters and deeply admire the magnificent fjords of Khasab, the stunning "Norway of Arabia." 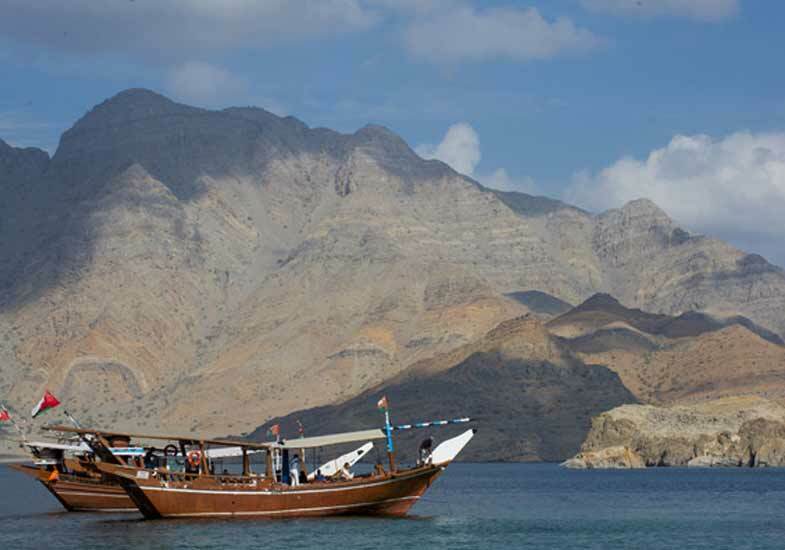 The steep limestone mountains of Hajar cut by the emerald green sea is an exquisite sight to behold as you and your loved ones cruise onboard a traditional dhow on this spectacular Musandam Khasab tour. Khasab is a beautiful landscape in the Arabian Peninsula. 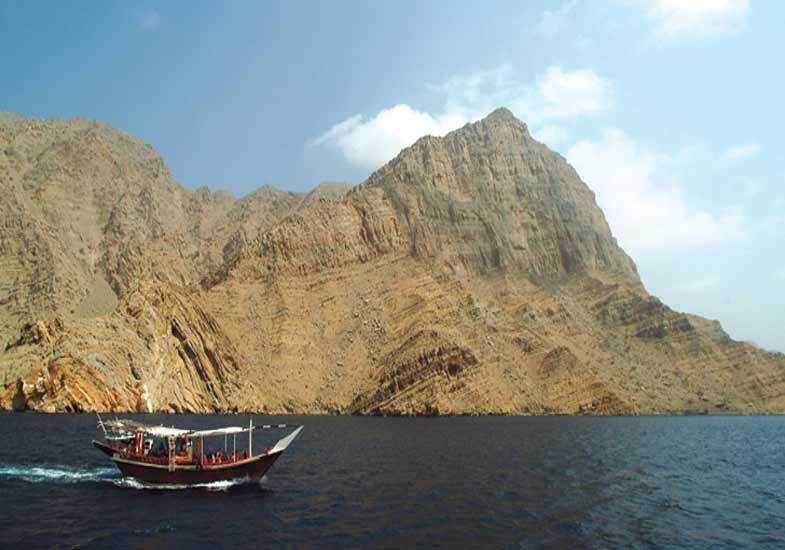 Categorized as the only point in the Middle East where vertical limestone mountain of Hajar is shaped by the sea creating the famous fjords which are habitat to colorful flora and fauna. Remember it requires visa and other formalities so before you finally make your minds make a question with us how it is done. Your exciting journey to Khasab starts with an early morning pickup from Dubai or Sharjah then a drive through Ras Al Khaimah. The road trip takes you along the coasts and the mountains where sharp bends, tumbling slopes, and steep heights stir your spirits up in preparation for an even more exciting day ahead. 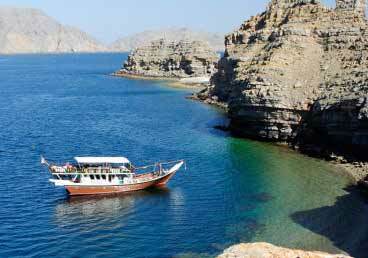 When you reach the at Khasab harbor, you climb aboard a traditional Omani dhow where you can now sit back and relax on the way to "Khor as-Sham," the largest fjord in Khasab. Along the way, you spot tiny fishing towns and quaint villages where old stone houses make the view as dreamy and fanciful as it could be. The abundant marine life in Khasab is the highlight of your trip, where dolphins greet you with their amusing aerial acrobatics and lighthearted playfulness as you cruise by. On Telegraph and Seebi Islands, your dhow drops anchor for you to enjoy some swimming and snorkeling goodness in the shallow and crystal-clear waters. A sumptuous lunch buffet of Continental and Arabic dishes, as well as refreshing drinks, will fill your tummy as you enjoy a memorable day of unmatched fun and pleasure on our Musandam Khasab tour. 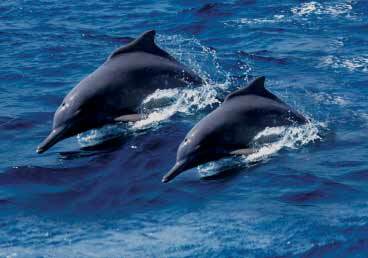 You will receive confirmation of your trip at the time of the booking. 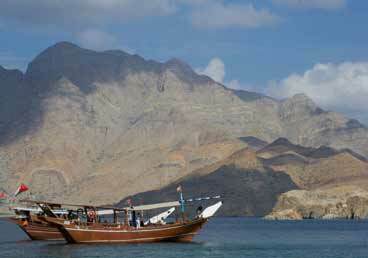 Original passport and visa are required when going on a Musandam tour. 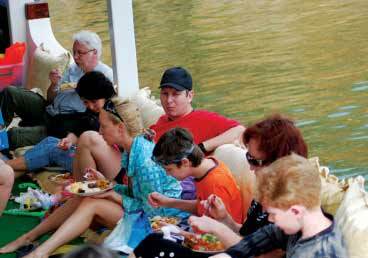 Complete information on the Musandam Tour visa and UAE re-entry documentation will be given to you at the confirmation of your booking. Most UAE residence visa holders, all citizens of GCC countries, and tourists from the EU, US, Australia, New Zealand and Japan can apply for a visa at the border of Oman. We reserve the right to cancel or postpone your trip for reasons beyond our control, such as severe weather conditions, equipment malfunction, government policies, or force majeure. We will either offer you a refund or work with you to reschedule your trip at a later date. If you cancel within 24 hours of your scheduled tour, or if you and your guests do not arrive at the designated time, you will be charged the full cost of the activity.